The New Liberal Movement counter-protested a rally in honor of International Workers’ Day. The protesters were confronted by leftists. 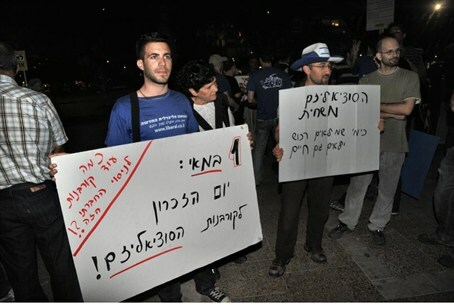 The New Liberal Movement in Israel held on Tuesday a counter-protest to the rally that was held in Tel Aviv in honor of International Workers’ Day which is marked on May 1. The leftist rally turned into a call to bring back last summer’s social protest and to overthrow the government. The purpose of the New Liberal Movement’s protest was to remind Israelis that socialism and communism, which are identified with International Workers’ Day, could have disastrous consequences. A confrontation later broke out when the leftists arrived at Rabin Square, where the counter-protesters were gathered.